6-Modes: Fast Flash Mode-Slow Flash Mode-No Flash Mode. 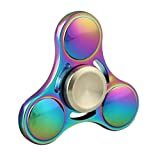 The light glow with 3 colors(red, blue and green)while you spin it. 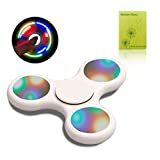 LED Fidget Spinner has button on every shinning part, you can press to change modes and the battery can be replaced when no lighting any more. Advantages: It can really help those who have fidgety hands or suffer from ADD&ADHD to relieve stress and anxiety. 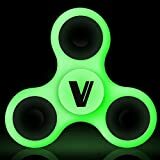 Spinner toy will also be helpful for people trying to stop smoking, nail biting or leg shaking. Press again, close the LED lights. The spinner can just shine on single side when rotation. You can just press one button and let others close, or other ways, the spinner can also shine. 100% Satisfaction Guarantee: If you are not satisfied with your purchase, contact us immediately and give us an opportunity to assist you. Your satisfaction is the most important thing to us.